The Sega Pico was targeted towards younger children (aged 2–8). 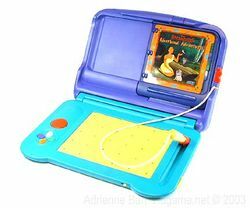 The system was half book, half electronic toy. The cartridges (called "Storyware") were like books, and when the player turned the pages, the picture on the screen would change. Although the Pico didn't support its own screen, it has to be plugged into a television from its AV output. To control the games you could use buttons and a "magic" pen. All software rated was rated EC - Early Childhood by the ESRB. The slogan of the Pico was "the computer that thinks it's a toy." North America and Europe had received games until 1997. A new version of the Pico called Advanced Pico Beena came out in 2005. However, games for this system are still being released in Japan. Pages in category "Sega Pico"
This page was last edited on 10 October 2008, at 07:43.